This is actually old news, but there has been so much to pack into the amount of time I have during a day that I'm just now getting around to telling you some awesome news. You've heard the term Bucket List, right? I've never actually sat down and written one and checked things off, but there's definitely a list in my mind. I finally got to mentally check off two things in quick succession and I'm SO excited. I haven't felt like I've accomplished much of anything for a while, so this felt extra special with pie on top. I've long admired every publication Stampington puts out. Their magazines shouldn't even be called "magazines". They're the size (and often larger) than many crafting books, the paper is sublime (I have a thing about paper texture), and the articles and tutorials are inspiring. 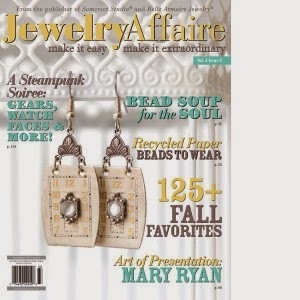 Two jewelry publications, Jewelry Affaire and Belle Armoire Jewelry, are the two I buy consistently, and I've always admired the artistry, and longed for the day when I might make something that would fit inside their pages. 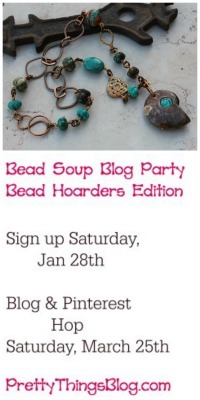 I was shocked when Jewelry Affaire contacted me, asking me if I'd be interested in writing an article about the Bead Soup Blog Party®. I actually had to check the email address to make sure I wasn't getting spoofed! 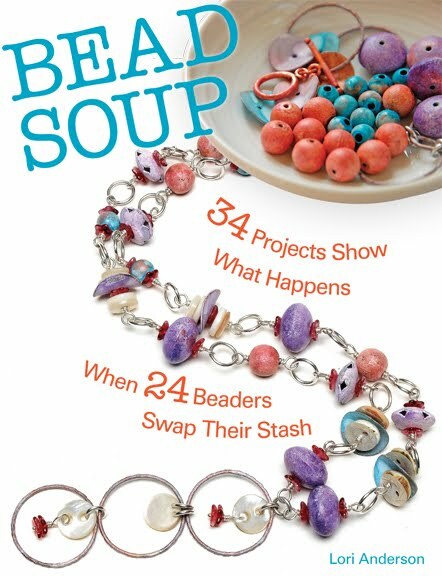 But it was true, and they included a lovely assortment of Bead Soup participant's work in the magazine, as well as showing the "raw" soups themselves. This came out in the Autumn 2013 edition. I was very pleased they included so many people's creations AND the soups they started with, all over ten pages. 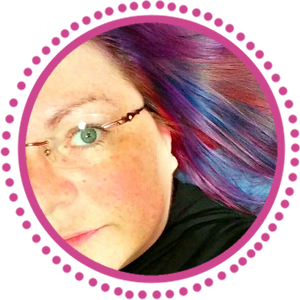 And if you want to see even more awesome creations, come visit my blog on May 3rd for the 8th Bead Soup Blog Party reveal! Use the up and down scroll bars of the embedded file to see. Following in those footsteps came the news that a necklace I'd made for a button blog hop, using a domed silver three pence piece that Niky Sayers sent to me made the grade. It was a piece I was extremely proud of, using not only the pence, but vintage lace, copper, white patinaed copper from Miss Fickle Media, pewter button links from Ornamentea, and vintage mother of pearl buttons from my own scarily vast collection. I sent a photo in, and was thoroughly shocked and delighted when they asked me to send it. 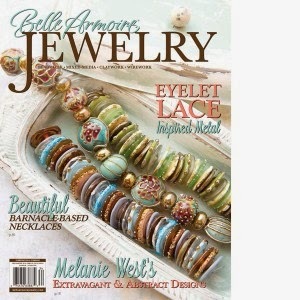 It appears in the Winter 2014 edition of the quarterly magazine Belle Armoire Jewelry. I have to say -- getting a tutorial into this magazine made me feel like I had finally made it. I can't quite explain why, other than to say check out Stampington's publications, and you'll instantly get a certain feel. I did the metal texturing and and patina for the copper semicircle and links, and overcame my fear of riveting to give some interest and polish to the pendant. And I went against my incredibly Type A personality to make "messy wraps" of all the linkages. Oh, man, I love how it looks when other people do it but I've never been good at it. To add a little something extra, I melted the ends of the silver wire to create a balled end so it would look a little more "done". As for connecting the pence and lace, I merely punched two holes in the copper and "sewed" the button on with thin wire. I made the clasp by creating a traditional hook shape and then wound it with thinner wire. There! I did it. Two things to check off the list. I'm not nearly as afraid to contact these magazines anymore, but even if I never get published in them again, I'm thankful and grateful for the opportunities. Back in what seems the dark ages, I updated my jewelry web site every weekend (if not every day), had a robust and active newsletter, and did a lot of juried craft shows. Ah, how times have changed! Today I sent out a mass email newsletter to my patrons for the first time in probably a year. If you have been wondering why the web site hasn't been mentioned and why you haven't seen much jewelry here, either, the following is the newsletter. If you would like to join the newsletter, just leave me a comment with it and I'll add you. Long time, no see, I know. It's been at least a year since I sent out a newsletter, and I hope you'll read this one and stay subscribed, because I'm very hopeful that this year will be an enormous change from the last year and a half. In a nutshell, I have been suffering from Lyme disease, a mold infection (both in my brain), and a handful of other things that developed because of it. For the first year, I was misdiagnosed with Lupus, and the medicine I was given actually made things worse. Thanks to one of my AMAZING customers, I am now in the care of a Lyme-literate doctor who got me diagnosed properly is getting me on the road to recovery. It's slow going -- I can have three hours out of bed a day, three days straight in bead, I never know. It's very difficult to plan beyond the next hour. That being said, to those of you who were going to see me (and help me celebrate my 45th birthday) this coming weekend and the Craftsmens' Classic, I will not be able to attend. However, if you are ever in the mood to visit me in my home in Easton, MD, I can gladly make arrangements for a private showing. I also am teaching jewelry making classes for a nominal fee. Email me for more information by clicking here. To get a discount coupon or preorder your tickets for the Chantilly, VA Craftsmens' Classic, click here. My web site is currently set up only to take Paypal (that will change soon) and for certain computers, you may get a notice that it's insecure. It IS secure, but the way my developer programmed it, when I took the credit card option away, it automatically spits out that message. That will be amended soon, too. If you would prefer to pay via credit card or check, all you have to do is email me. the deepest discount I ever give. I will be adding new and (in my opinion) improved jewelry very soon! And if you follow me on Facebook (here), or my blog (here), you'll often get first crack at any jewelry I make, as I've had things sell in 30 seconds of posting (thank you thank you thank you). The next email will be to announce new jewelry. YAY! 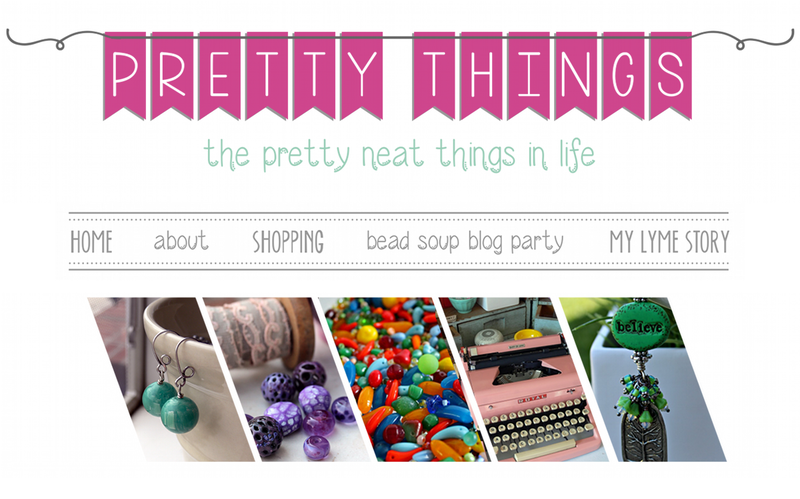 My popular blog hop, the Bead Soup Blog Party, attracted the interest of Kalmbach Publishing, and two years later, it came out to Amazon, Barnes and Noble, and now Michaels Craft Stores. If you would like an autographed book plate, all you have to do is send me what you'd like it to say and your address and I'll send it right off! 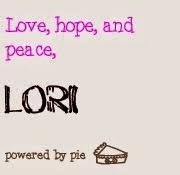 Copyright © 2014 Lori Anderson Designs, All rights reserved. Today Zack had his annual dental checkup (no cavities, thank you Sonicare and flossing!). Next step....braces, which will be interesting because he still has 12 baby teeth that haven't come out and he's eleven. I'm not sure how that will work but as soon as my braces come off (next month, I think! ), his go on. The pediatric dentist gives balloons to all the kids, and back when Zack was very little, I told him that if he made a wish and let the balloon go, when the balloon traveled a while and popped, his wish would rain down. 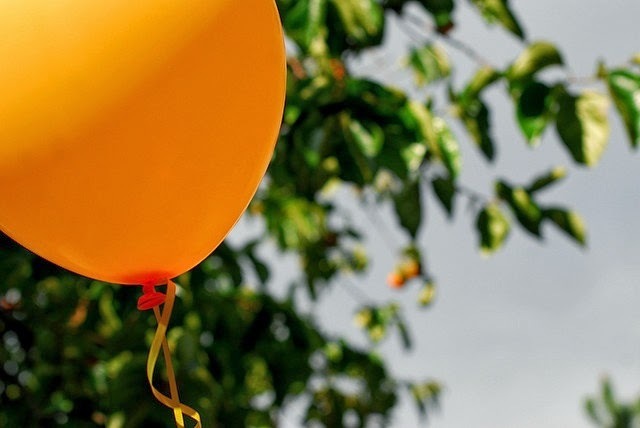 This originally started not because I'm a cool mom, but a mom who was tired of chasing down half-deflated balloons and also appreciated being able to drive without being beaned in the back of the head with said balloon. I love that even at eleven, he's still very much my sweet little boy, the kidlet who I used to be able to carry. In so many ways, he's mature beyond his years, but in others...still innocent and wide-eyed (may he never lose that). Instead of turning down the balloon as too babyish, he took it. When we went outside, I asked if he was going to make a wish. He asked if it was OK to say it out loud and I said yes, I didn't believe in the superstition of not telling. He used to wish for what you'd expect from a little boy ... Lego, Hot Wheels, pizza. Tapping this out on my Kindle, hoping it doesn't crash again, but it's been a while, and there are some special things I hope to write about soon, but I am just too exhausted. But I do want to make a comment about friendship. I don't have a lot of close friends. I know a lot of people online (and I think a lot of the time, you can really know who is real online and who is blowing smoke, although we've all been fooled at some point, I'm sure). But as to people I go out with, talk to weekly, have coffee with, just sit with....well. THAT is a different story. I think back to when I had tangible friends, and I realize since I no longer have a corporate job, no longer teach fitness classes, and live in a small town, it may not be, as I've often considered, all my fault. 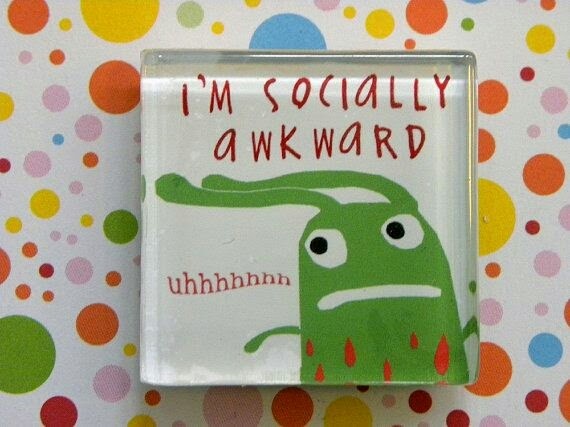 And I am, I firmly believe, "socially awkward ". It's not catching, but it IS uncomfortable. I am very lonely as I try to get better. I used to be called a workaholic, the Energizer Bunny. Now, largely because I don't see an end in sight to the Lyme disease and liver toxicity and weight loss and brain freezes and nausea, I've gone beyond Socially Awkward to Socially Invisible. And yet. That is not entirely true. I learned that a couple days ago. The experience totally changed my outlook on what a friend is. 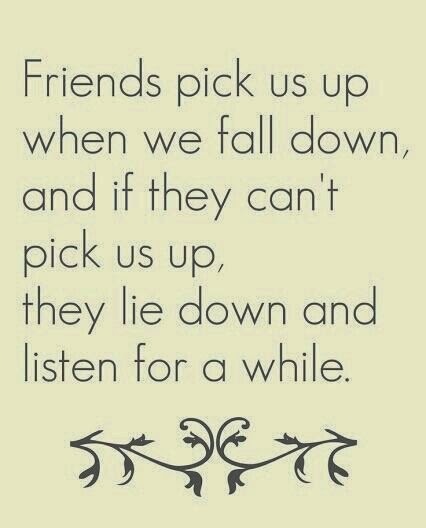 A friend doesn't always have to be someone who's been in your life since grade school. A friend just needs empathy for a person when they need it, and gives that empathy (or humor, or whatever the situation calls for) without hesitation. No pettiness, no eye rolls, but kindness. The other day I was in a very bad place, worse than usual, and I needed someone to talk to me, about ANYTHING, until my husband got home (an hour's drive off). I bared my soul and posted on Facebook. I was afraid to try and call anyone from my small list of numbers because if I got an answering machine, it would have wrecked me....that's how crappy I felt. I didn't want to call Rick and have him drive the entire hour on hands free, worrying. So I posted a call for help. People I've met at shows. People I've emailed a few times about beads. People who I didn't recognize. In the time it took for Rick to get home, these people, these FRIENDS, let me be weak and held me up. 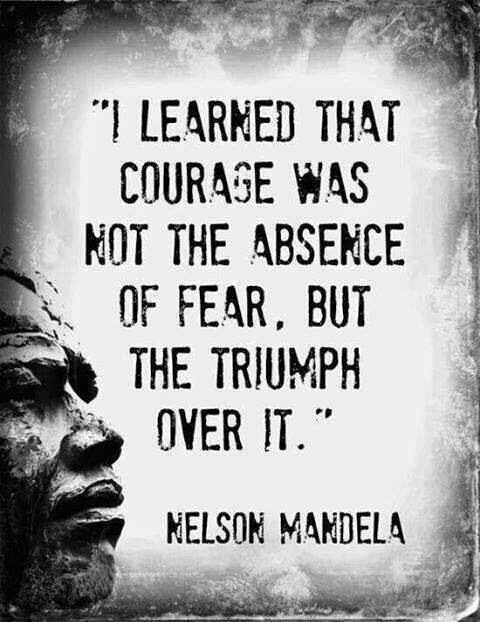 I know it's a risk every time I put my soul out there, but the good from doing that far outweighs the bad for me. It's not for everyone, and when Rick got home, I thanked everyone and deleted the post. I don't delete posts because I'm afraid, as some have scornfully said in the past. I deleted that post because it had other people's personal things on it, and in the rush to help, maybe they didn't want all that out there. Plus, I'd internalized everything and didn't want to revisit that particular hour of my life. I don't particularly enjoy writing about The Sads, but it's part of my life. It is not my ENTIRE life, but it certainly has changed it, and I have to believe (HAVE to believe) that whenever I come out of this, I'm going to be healthier than I've ever been and ready to take on the world again. 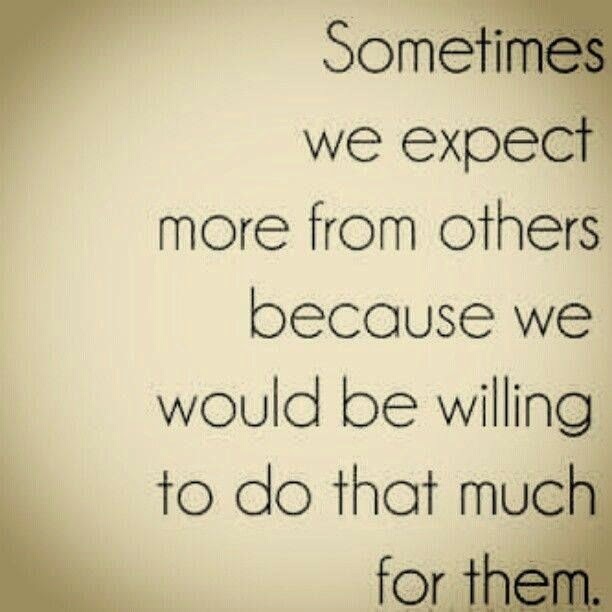 But this time, I'll know what's worth my time, and what (and who) is not. I hope my readers, who I love and respect so much, hang with me. If you hate these posts, I hope you come back for the fun stuff. And there IS fun stuff. Love to all, and thank you.